BALDWYN – L. R. Burcham, 88, went to be with his heavenly Father early Monday morning, January 28, 2019. He was born on August 29, 1930, to James and Vera Burcham, in Itawamba county Mississippi where he lived much of his childhood. 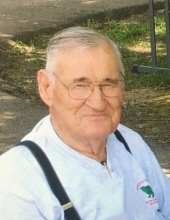 He resided in the Pratts Community in Lee County for most of his life where he was affectionately known as the “Mayor of Pratts” by many of his friends. L. R. loved his community and actively participated in developing and participating in community events throughout his life. He especially enjoyed the Froglevel Festival which he organized 36 years ago. He was loved by all who knew him and was well respected in all of his endeavors for Lee County, Pratts and Baldwyn. He worked for Pennsylvania Tire and Rubber Co. and the CDF Foundation for many years in Tupelo, Mississippi. He loved his former co-workers and visited with them as often as possible. L. R. loved to talk and fellowship with all his neighbors and friends in Pratts. He especially enjoyed his mornings at Agnew’s round table. He was a member of the Friendship Baptist Church in Guntown, Mississippi, where he served as deacon. His love of his Savior was evident wherever he went and he never missed an opportunity to witness to others and proclaim his love for Jesus. He truly lived the words of our Lord, “Love the Lord thy God with all thy heart, with all thy soul, and with all thy might” and he certainly “Loved his neighbor as himself.” L. R. was a servant and he served his Lord well. He is survived by his wife of 63 years, Vadeen Barnett Burcham of Baldwyn, who he loved dearly. She was his “angel” on earth. He is also survived by his children, Theresa Hellen of Baldwyn; Janet Johnson and her husband Mike of Rienzi; Joan Blassingame and her husband Joe of Baldwyn; and Mark Burcham and his wife Karen of Ecru. His pride and joy were his grandchildren, Renae Vallas and her husband Jason of Oxford; Katy Rose Wilson and her husband Jordan of Baldwyn, Blake Burcham of Pontotoc and his fiancée, Megan. He loved his grandchildren dearly but his great grandchildren, Rosie Beth Wilson and Jon Vallas, were the highlight of his life. They brought him much joy and happiness during the time that he had them. They were truly precious gifts from God to their Papaw. He is also survived by his sister, Joyce McKibben and her husband Gerald of Starkville; his sister-in-laws, Ann Crabb of Booneville and Margaret Burcham of Tupelo; and brother-in-laws, Paul Leahy of Mayfield, KY and Bill Colbert of Tupelo. L. R. is survived by a host of nieces, nephews, great nieces, and great nephews whom he loved seeing each year at the Burcham reunions. L. R. was preceded in death by his parents, James and Vera Burcham; his brothers, Lamar, Charles Ray, and Jack Burcham; his sisters, Margaret Bigalke and Helen Leahy; his nephews Dwight Burcham and Ted Burcham; his great-nephews, Larry McKibben and Craig Bryson; and his great-niece, Bridgett Marler. Visitation will be held at Waters Funeral Home, Baldwyn, Mississippi, from 5:00 until 8:00 on Tuesday, January 29, 2019, and his funeral services will be held on Wednesday, January 30, 2019 at 2:00 at Waters Funeral Home with Bro. Fred Hartley, Bro. Gladwin Carpenter and Bro. Mike Johnson officiating. Burial will be in Pratts Cemetery. Pallbearers will be Everett McKibben, Phillip McKibben, James Burcham, David Burcham, Curt Burcham, Marty Burcham, Reid Michael and Ross Michael. Honorary pallbearers will be Earl Stone, Eddie Scott, Joe Roberts, Terry Dale Roberts, Buck Edge and Reid Smith. In lieu of flowers, the family is requesting that donations be made to the American Cancer Society, 1380 Livingston Lane, Jackson, MS 39213 or the Pratts Community Scholarship Fund, 193 CR 2890, Baldwyn, MS 38824. To plant a tree in memory of Leland L.R. Burcham, please visit our Tribute Store. "Email Address" would like to share the life celebration of Leland L.R. Burcham. Click on the "link" to go to share a favorite memory or leave a condolence message for the family.